So you've visited every Fiesta food stand, watched the dancers and done the parade thing. What's left to do in Santa Barbara? You've barely begun. Now's the time to visit the city's many and varied attractions, most of which capture Santa Barbara's historic and cultural heritage and spectacular setting. Here are a baker's dozen of some top favorites. (Note: Some attractions close the afternoon of the Fiesta parade, but you'll be among parade-watchers, anyway, right?) Gift shops are available at many locations. For times of tours, contact museums. 1. Santa Barbara Mission, 2201 Laguna St. The magnificent Queen of the Missions is high on everybody's must-see list. 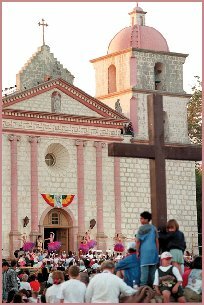 Tenth in the chain of 21 California missions, it was founded in 1786. Damaged periodically by earthquakes, the twin-towered structure has been used continuously as a house of worship since its founding and is still a parish church. Self-guided tours include museum rooms, Mission garden, church and cemetery, 9 to 5 daily (skip the church during Sunday Masses, please). Admission $3, children under 16 free when accompanied by an adult. How to get there: Follow Laguna Street (four blocks east of State Street) north until it ends. The Mission is at the very top of Laguna Street. Parking available. 2. 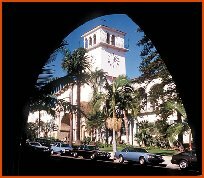 Santa Barbara County Courthouse. Another must-see. Built in Spanish-Moorish style following the 1925 earthquake, it has been acclaimed as one of the most splendid municipal buildings in America. It's often featured on television. Don't miss riding the elevator to the top of the tower for a spectacular view overlooking the city's red tile roofs to the mountains and the sea. Since this is a working courthouse (courts may be in session), there are regular business hours. Open weekdays 8-5, weekends 10-4. How to get there: The Courthouse covers a full city block between Anacapa and Santa Barbara streets, and Anapamu and Figueroa Streets, a block off State Street. You can't miss it. Nearby municipal parking lots (first 90 minutes free). 3. El Presidio de Santa Barbara State Park, 100 block of East Canon Perdido Street. On the site of an 18th century Presidio  one of four from San Diego to San Francisco, an authentic reconstruction of the original adobe quadrangle is ongoing. Completed so far are a chapel, padre's and comandante's quarters and a Northeast Corner, with an observation tower, scheduled to open late this summer. Only two tiny parts of the original Presidio remain, El Cuartel and the Ca�edo Adobe, facing each other across East Canon Perdido Street. The Ca�edo Adobe, housing the Santa Barbara Trust for Historic Preservation, is incorporated in the restoration. Hours: 10:30-4:30. Free. Donations. Guided tours. How to get there: Presidio reconstruction is centered around the intersection of Canon Perdido and Santa Barbara streets (two blocks east of State Street). Parking: Not on your life. Good luck wrestling local office workers for curbside spots. 4. Stearns Wharf. End of State Street. An actual 1872 wharf where lumber was once unloaded to provide building materials for many of the city's early Victorian dwellings. Passenger steamers also stopped. Today it's a tourist attraction with restaurants and shops  Santa Barbara's touch of New England. The Sea Center, located on the wharf, offers a look at marine life (Admission $2) and is open daily as are shops. How to get there: Drive down State Street to the ocean. Go as far as you can and you'll find yourself headed out to sea on the wharf. Parking is permitted on the wharf: $2 an hour or part of an hour. Validated parking available from restaurants and vendors. First 15 minutes is a free "grace period" if you run a short errand. You may also stroll onto the wharf off Cabrillo Boulevard. 5. State Street. Santa Barbara's Main Street, the attractively landscaped downtown street is lined with restaurants, cafes, coffee shops and specialty shops. After the 1925 earthquake destroyed many of the old buildings, the street was redone along Spanish Colonial lines. A fun place to walk, browse, people-watch, or dine in sidewalk cafes. The Fiesta parade goes down State Street. How to get there: Follow the crowd. Parking in numerous municipal parking structures on adjacent side streets (first 90 minutes free). 6. Santa Barbara Botanic Garden, 1212 Mission Canyon Road. A 65-acre botanical showplace along Mission Creek in the foothills above the city. Features native plants and a variety of plant communities. Trails lead through a meadow, a canyon and redwood forest, across a historic dam used to impound water for the Mission, and along ridgetops with views of offshore islands. Open 9 a.m. to 5 p.m. weekdays, 9 a.m. to 6 p.m. on weekends. Admission $3 for adults, $2 for seniors and teens, $1 for children 5 to 12; children under 5 free. How to get there: From the Mission, follow Mission Canyon Road about a mile north into the foothills. Parking available. 7. Santa Barbara Museum of Natural History, 2559 Puesta del Sol Road. Exhibits feature American Indian history, birds, mammals, geology, insects and marine science. Outstanding dioramas. A planetarium offers daily shows. This summer's attraction: a Shell-A-Bration. Open Monday through Saturday 9 a.m. to 5 p.m. Sundays and holidays, 10 a.m. to 5 p.m. Admission $5, teens and seniors $4, children, $3. How to get there: Located on the bank of Mission Creek just behind the Mission. Follow signs off Mission Canyon Road. Plenty of parking. 8. Santa Barbara Historical Museum, 136 E. De la Guerra St. Local history exhibits and extensive research library. Also on the grounds is the Covarrubias Adobe built in 1817 and, according to legend, briefly the capitol of California in waning days of Mexican rule. How to get there: Located at the corner of De la Guerra and Santa Barbara streets (two blocks east of State Street). Small parking lot off De la Guerra Street. 9. Santa Barbara Museum of Art, 1130 State St. Treasures that span 41 centuries from Greek and Roman sculptures to exciting art of our time. Tours. Open Tuesday through Saturday, 11 a.m. to 5 p.m., Thursday to 9 p.m., Sunday, noon to 5 p.m. Admission: $4, seniors $3, children 6-17 $1.50, under 6, free. Free admission the first Sunday of the month and every Thursday. How to get there: At the corner of State and Anapamu streets, a block from the Courthouse, the building, once a post office, has been extensively renovated. Currently in the process of a major expansion. Municipal parking garage located directly behind the museum off Anacapa Street (90 minutes free parking). 10. Beaches. Beaches. And more beaches. Name your own. Favorites include East Beach (east of Stearns Wharf), famous for volleyball and a Sunday arts and craft show in nearby Palm Park; and West Beach (west of the wharf), with a nearby harbor area (a walk on the breakwater is spectacular at sunset). Popular outlying county beaches are Arroyo Burro (end of Las Positas Road), and Goleta Beach, off Ward Memorial Boulevard. A few of the best things in life, like beaches, are still free. How to get there: Head for the ocean. There is parking in municipal beachside lots (fee) near West and East Beaches. Parking at Arroyo Burro and Goleta Beach is free. 11. Santa Barbara Zoological Gardens, 500 Ni�os Drive. OK, it's not the San Diego Zoo. But there's great charm in this attractively landscaped oceanside gem, once an estate. Animals in natural settings. Current favorites: Three Western lowland gorillas and leopard kittens. A miniature train ride around the zoo perimeter offers nice views of the city. Hours: 10 a.m. to 5 p.m. daily. Admission $6; children 2-12 and seniors, $4. Train ride is 50 cents for kids and $1 for adults. How to get there: Located near East Beach; turn off Cabrillo Boulevard onto Ni�os Drive toward the mountains. Parking (free) and zoo entrance are on your right. 12. El Paseo. Quaint, so-called "Street of Spain" dating to 1920s. Collection of shops and restaurants offering outdoor dining. Historic Casa de la Guerra, an early day residence mentioned in Richard Henry Dana's "Two Years Before the Mast," is encompassed in the enclave. You're right across the street from the Fiesta's El Mercado in De la Guerra Plaza. How to get there: Bounded by State, Anacapa, De la Guerra and Canon Perdido streets. Walkways enter from each street. Private and public parking lots nearby. 13. Paseo Nuevo. A shopping center on the list of attractions? Paseo Nuevo is more than shopping. After you've shopped till you drop in anchor stores Nordstrom and Macy's with a wide variety of shops in between, relax at a sprinkling of cafes with outdoor dining, noon concerts, or a movie theater. It's Santa Barbara's new version of Main Street. How to find it: Located between State, Chapala, Canon Perdido and Ortega streets. Underground parking off Chapala. Also municipal lots in the area. Walk-in entrances off State Street. Finding your way around Santa Barbara isn't exactly a day at the beach!